Thank goodness for spell check. I haven't been able to spell "occasion" in my entire life. Or "restaurant". And yes, I have a college degree in English. I do know how to spell fail (B-E-T-H). Tomorrow I'll be sharing the flower girl dress I made for AB for a wedding this past weekend. It was my first time making a fancy dress, so it helped to have this book on hand. I picked this up at a used books store, although I had previously checked it out from the library (so I knew it was worth buying). Pay no attention to the obviously dated photo on the front cover. All these Singer Sewing Library books look dated, but the information is great. 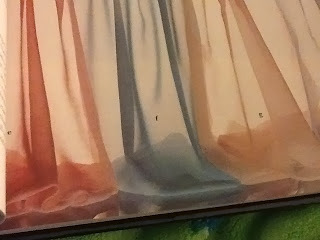 Like all the Singer Library books, the information is very specific (special occasions, knits, sergers) but that means you can quickly find what you need. 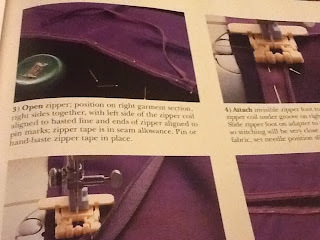 If you want to brush up on invisible zippers, you can review the (excellent) photographs and the accompanying text. 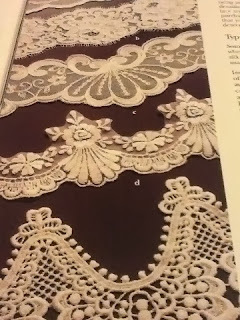 This is the only book I've read that goes over intricate details like button looping trim, lace sleeves, and button cuffs. There are explanations of the types of special occasion fabrics and how best to work with them (seams, finishes, etc.). It also covers speciality items like netting and lace. Before I started on AB's dress, I was very intimidated by the world of special occasion sewing. Reading this book made me feel confident enough that I could handle it, and I think I have a lovely dress to show for my efforts! Stay tuned until tomorrow for all the details!